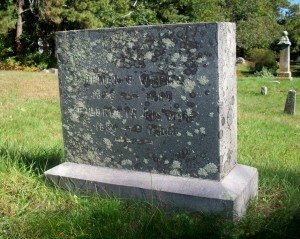 Born: August 5, 1836 in Falmouth Ma. 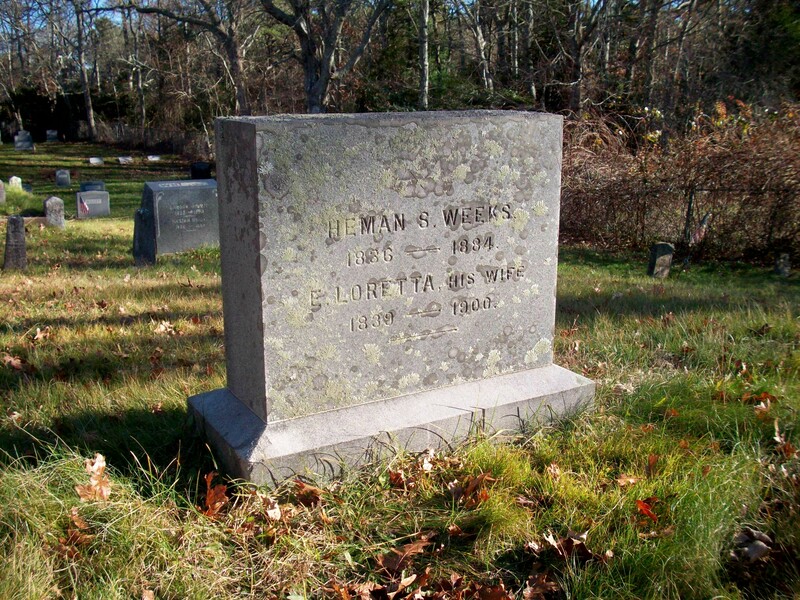 Died: February 22, 1884 in Falmouth Ma. at 47 yrs, 6 mos, 17 d.
To: Elizabeth Loretta Wright; (1839 – 1900) (Stillman Wright & Zilpha E. Hammond); Elizabeth married (2) Heman’s brother Uzzial Weeks (1826 – 1909) (Marcus Tullus Cicero Weeks & Roxanna (Weeks)) in Bourne Ma. on October 28, 1891; Uzzial married (1) Sarah Swain Folger (1830 – 1890) (Mark Folger & Nancy Swain) in Nantucket Ma. on August 30, 1849 & married (3) Judith G. Folger Burdick (1835 – 1915) (Mark Folger & Nancy Swain) in West Springfield Ma. on June 7, 1902; Judith married (1) Henry C. Burdick (1831 – 1898) (Christopher Burdick & Lydia Easton) in Nantucket Ma. on November 19, 1856; Uzzial & Sarah are buried in Hampton Cemetery in Hampton Iowa; Judith & Henry are buried in Prospect Hill Cemetery in Nantucket Ma..
1. 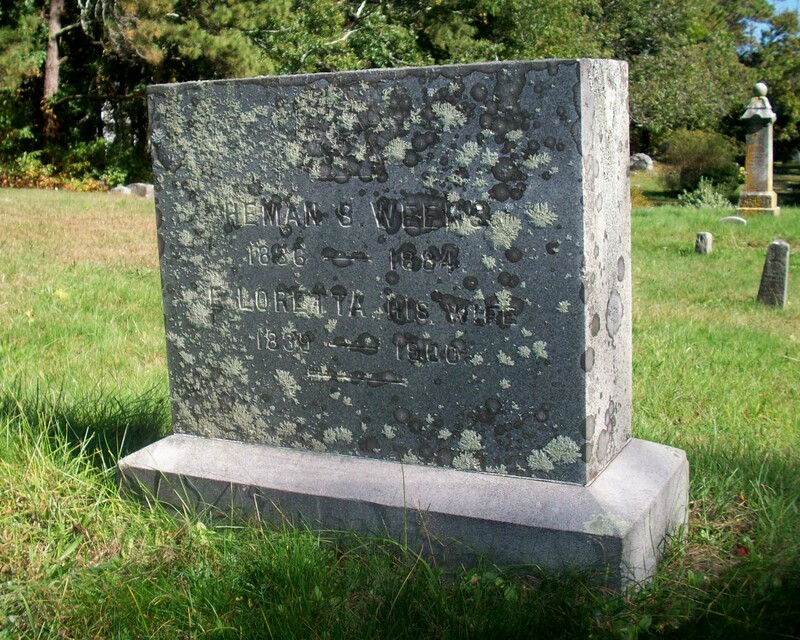 Asa Tobey Weeks; (February 2, 1864 – December 29, 1930); Married (1) Lillian Jane West ( 1866 – 1947) (John M. West & Hannah H. Bowman) in Falmouth Ma. on April 6, 1884 & married (2) Emma L. Luscomb (Abt.1871 – ?) (Richard L. Luscomb & Ann Hurle) in Everett Ma. on September 13, 1896 & married (3) Jessie Amelia Mason (1875 – ?) (John Mason & Margaret Grant) in North Berwick Me. on August 20, 1921; Lillian married (2) LaForest Wood Kendrick (1877 – 1946) (Henry H. Kendrick & Mercy Ann Raymond) in Bourne Ma. on November 9, 1896; Lillian & LaForest are buried in Friends Burying Ground in West Falmouth Ma..